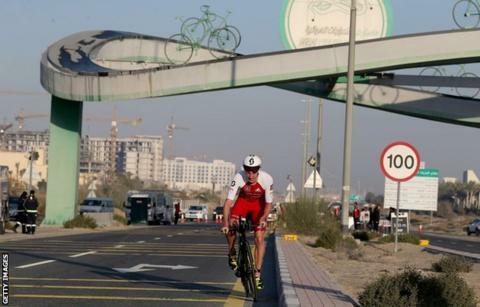 Britain's double Olympic triathlon champion Alistair Brownlee claimed a dominant win at the Ironman 70.3 in Dubai in his first event after injury. Brownlee's 2017 season ended in August when he had hip surgery. His time of 3 hours 35 minutes 32 seconds was more than six minutes ahead of second-placed Swiss Sven Riederer. The Dubai event is the first of a triple crown series, with Brownlee on course for a $1m (£703,000) bonus if he claims all three. An Ironman 70.3, or half Ironman, combines a 1.2-mile swim, a 56-mile bike ride, and a 13.1-mile run. The remaining two events take place in Bahrain and South Africa later this year. Brownlee said: "Obviously it is so fantastic to be back after too much time spent at the gym in the past six months. "I did not feel great on the swim, had a couple of bad patches on the bike but on the run I just felt great, I was in control and I actually really enjoyed the last 10-18km. I was just soaking it in and enjoying the cheers." Alistair and brother Jonny are scheduled to take part in the World Triathlon Series season opener in Abu Dhabi in March, as well as the Commonwealth Games in Australia the following month.